It is large enough to carry a dSLR plus long (6") lens attached, and another 2 smaller lens, or 1 lens and a flash and some other items. The inside padding is fully adjustable, as long as you don't mind fighting the velcro panels for a bit. There is always some tension between how much gear to lug around and how cumbersome it is. This has a good balance for what I want. There is a large pocket in the flap, another set of deeper pockets on the front, a slot for a mobile phone and a thin sleeve on the back for a map. Plenty of space for extra batteries, another memory card, other filters and physical film (if digital isn't your thing). Aside from not looking like a camera bag, the messenger bag design works well since it is easy to slide around to get at your camera quickly. 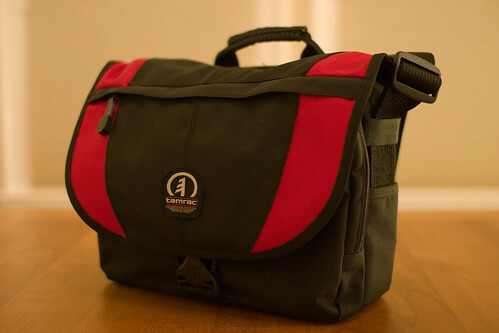 Much simpler to grab the camera, shoot and put it back than a backpack style bag. My biggest complaint is that the latch on the main flap is a difficult to close one-handed. I like having a place for my mobile phone, but the slot is very tight. The phone won't fall out, but it isn't easy to pull out either (and my Motorola PEBL isn't that large). In the most recent issue of JPG Magazine there was a positive review (oddly not online) of the Crumpler "6 Million Dollar Home" Photo bag. Looks like a nice choice at about twice the price of the Tamrac.